Mazars Grange batsman George Munsey believes he has learnt a lot playing on the international stage over the last few weeks – and now he wants to put the icing on the cake by helping Scotland win some silverware this weekend. The 22-year-old has put in some cracking performances in the ICC World Twenty20 qualifiers so far, helping the Scots top their group and reach next year’s showpiece event in India. However, they are now in Dublin this week for the knock-out stages of the qualifying event and they have the chance to win a trophy, which would give the sport in this country a big boost. Tomorrow they face Hong Kong in the first semi-final at Malahide in Dublin (10am) before Ireland take on the Netherlands in the second semi at 2.15pm. The third/fourth place play-off and the final then take place at the same ground on Sunday. Ahead of the action, Munsey said: “I have loved being part of the Scotland squad over the last few weeks. “It was pleasing to play in the two warm-up matches that we had against Namibia and Jersey and then to keep my place for all six group matches. “I think our team spirit was there for all to see last week when we strung together three wins against Kenya, Canada and Oman when the pressure was on after two losses. “After the Oman match last Saturday we had a bit of an anxious wait to find out how the Netherlands had done. In the end we had done enough, winning four matches out of six, to top the group and secure a place in India. “Of course playing there next year is an exciting prospect for us all, but for now all we are concentrating on is this weekend in Ireland. The Scots squad has been training in Dublin all week, as well as having a couple of rest days after a hectic schedule. That downtime has allowed Munsey to reflect on his own performances to date where he has scored 139 runs in the six tournament matches and taken a number of very good catches. “I think I have done okay for the team and batting-wise I have enjoyed being at the crease. I am starting to feel quite at home at this level and hopefully I can kick on from here,” the left-hander explained. “Obviously it has been nice to take some catches myself, but more importantly we have really fielded well as a team. In Twenty20 cricket every run is so important, so we pride ourselves on our fielding. 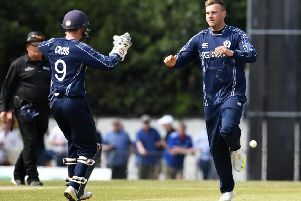 Scotland head coach Grant Bradburn is unlikely to make many changes to his XI for tomorrow’s match, meaning that Heriot’s spinner Mark Watt may miss out. Carlton seamer Ali Evans will be looking to add to the 11 wickets he already has to his name in the tournament. tournament director, has hailed the matches that took place in Scotland as a great success. Between July 6 and July 18 a number of warm-up games and Group B encounters took place at The Grange in Stockbridge, Heriot’s Goldenacre ground, Watsonians’ Myreside ground and at New Williamfield in Stirling. While the latter was sadly hit by weather problems, the three Capital grounds saw all of their matches being completed and McIntyre said: “The ICC have given us good initial feedback about the section of the tournament that took place in Scotland. “It was great to see the grounds looking so good and the facilities are top notch. Everyone who saw The Grange on Sky Sports was also very impressed, while I must take my hat off to the Cricket Scotland staff and the volunteers who made it happen.